Well, that old school winter we’ve been having is still around. 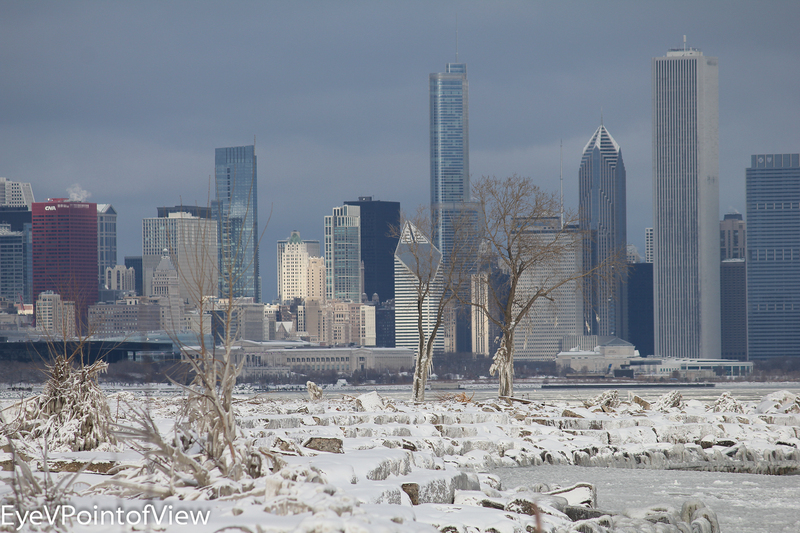 Hearing that the East Coast of the US was going to be hit with a ‘wintry mix’ of snow, wind, and rain in freezing temperatures reminded me that one winter morning, after a substantial ice storm in Chicago, I had taken a photo walk. 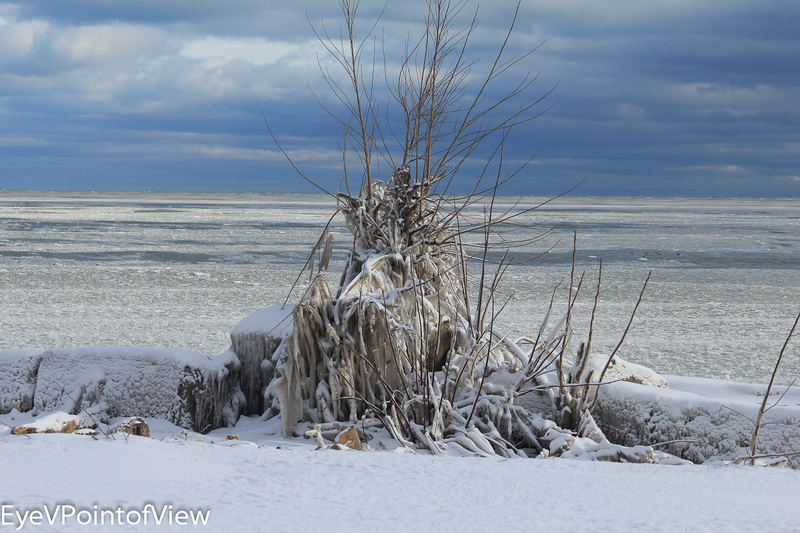 I was amazed at the ice structures that had been naturally formed when the huge waves from Lake Michigan washed over the stones, bushes, and trees that lined the lake front. 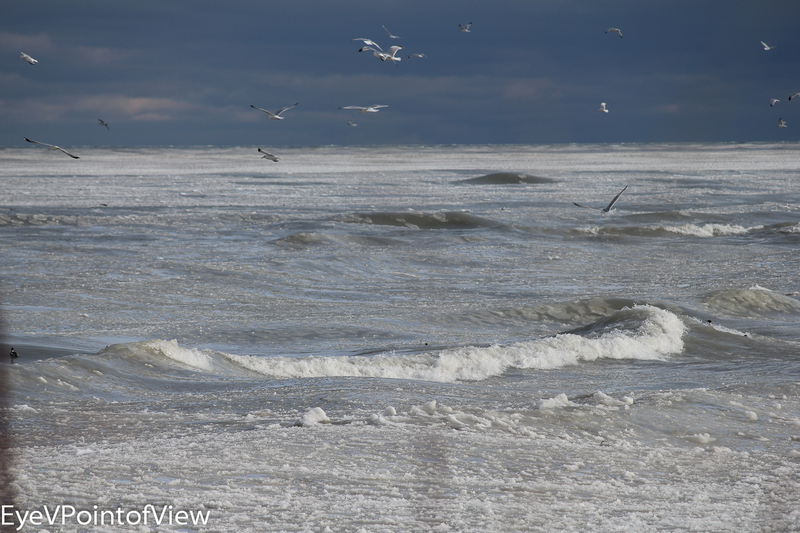 I was also amazed that they day after such a brutal storm could in itself be so beautiful, and become a backdrop for the raw, icy lakefront path. Food! – Nothing like a frenzied, windy lake to bring food up from the bottom that might otherwise stay away from the lake’s surface. These seagulls are circling around the water to take advantage of the bounty. Skyline – There are not many days where the skyline seems so close you can touch it, when you are miles away, but this was clearly one of them! The rocks in the foreground are separated from the skyline by a whole expanse of Lake Michigan (harder to see), but they seen to create the ‘front yard’ to the city’s downtown high rises. Ice Cluster – Yes, I had to get up close and personal with one on the ice clusters! This cluster hung from a tree along the lakefront bike path, where only the lowest branches were so covered. This tree was 50 feet from the water (at least) — the waves that reached as far as this tree were relentless. 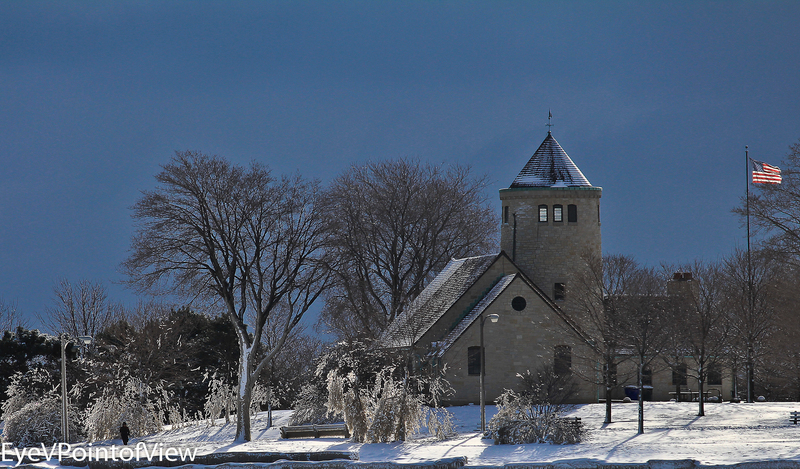 Promontory Point – Wow! The front of this building and the ice-covered bushes seem to glow in this picture. 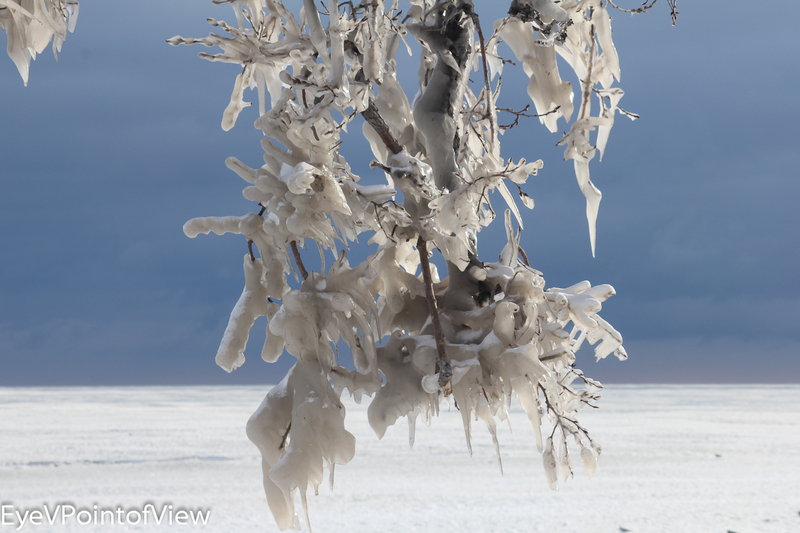 The lower branches of the trees and some bushes have a thick coating of ice on their individual twigs and branches. Amidst the mostly subdued color palette of the day, the US flag stands out on the right side of the photo. Still Standing – Winds 20 to 40 miles per hour pummeled the lakefront, resulting in huge waves crashing over the rocks, sometimes reaching the paved path, tens of feet away. Against this onslaught, this bare bush stood, some branches reaching to the sky, others bowed over from the weight of the ice. Even the harsh winter presents 5* photo opportunities. I hope you enjoyed these.